Our district installs Microsoft Office 2003 on all Windows computers. We tried the free OpenOffice suite alternative as a cost-saving measure, but returned to Office 2003 because macros in Excel documents distributed by our state department of education do not work with OpenOffice Calc. Additionally, several teachers and administrators could not read OpenOffice XML .docx, .xlsx, and .pptx documents on their home computers, even though they could at school because we installed the Microsoft Office Compatibility Pack for Word, Excel, and PowerPoint. We continued with Office 2003 even after the release of Office 2007. The new Ribbon interface in Office 2007 frustrated experienced Office users who preferred familiar drop down menus to tabs and the Microsoft Office Button. In Office 2007, tabs grouped tools by task. Frequently used tools and commands were not where they were supposed to be. As a result, tasks that took only a few seconds in earlier Office versions required minutes in Office 2007 as users scoured the tabs searching for commands. Office 2010 (office.microsoft.com/en-us), Microsoft's latest Office suite, continues with the Open Office XML format and tabbed Ribbon interface. However, locating commands and features across the various tabs now has a "friendlier" quality because the Microsoft Office Button has been replaced by the familiar File drop down menu, allowing users to Open, Save, Print and manage documents in "Backstage" view. To improve usability, Microsoft has also enhanced its Ribbon with contextual tabs providing additional tools when working with particular elements on a page (e.g., a cell in a Microsoft Excel worksheet, at right, or a picture in a Microsoft Word document). Plus, Microsoft has added customizable Ribbons to OneNote, Publisher, SharePoint, and InfoPath (its forms-creation and data-gathering tool in Office Professional Plus 2010), enabling users to add or remove commands according to personal preference. Office 2010 takes computing into the 21st century with its emphasis on collaboration and sharing files in the "cloud." Users in several locations can easily work together on a single document, editing simultaneously using Office 2010 Web App versions of Word, PowerPoint, Excel or OneNote and SkyDrive, Microsoft's free Windows Live service. Office Web Apps each contain a limited subset of their respective parent features. Yet they provide a dynamic way for users to continue working in an "Office" environment (complete with installed system fonts,) even though their physical workspace has moved online. A Windows Live account comes with 25 GB of password-protected online file storage, so there's plenty of room for documents, presentations, spreadsheets, data files, movies and pictures. Other enhancements and new features in the Office 2010 suite include improved picture editing tools across applications so that users can automatically apply borders, special effects, and layouts to selected images (see below). Word, Excel, Publisher, and PowerPoint also feature Live Preview, letting users experiment with and view formatting changes before applying them. PowerPoint 2010 now supports QuickTime movies! Users no longer have to link the QuickTime clip to a presentation slide or convert the file to an AVI movie format before incorporating the video. They simply choose a slide layout with an Insert Media clip element, click it to open the Insert video dialog box and choose QuickTime Movie file (*.mov) from the drop down file type list. This alone would be a game changer, but there's more! 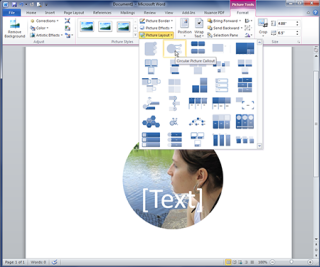 PowerPoint 2010 includes some basic movie editing tools, enabling users to Trim the length of an inserted video, add borders and apply other special formatting effects. Once you've created a presentation, you can share it over the Internet using the new Broadcast Slide Show option (see below). Any remote viewer who receives the Broadcast Slide Show link can use Internet Explorer, Firefox or Safari to watch the presentation, even if they don't have PowerPoint 2010 installed. Invitees will see the slides advance as you present them, complete with slide transitions and animations. Embedded sounds, however, do not present. Excel 2010 offers new Equation editing tools, enabling students and teachers to insert equations into worksheets and construct equations using math symbols stored in the Symbol Library. If you choose the Equation tool, a host of preconfigured equations suitable for classroom use become available, including area of a circle, Pythagorean theorem, quadratic formula and Trig identities. PowerPoint's Broadcast Slide Show option does not support audio sounds or voiced narration. You can't upload a document directly to Microsoft Office Web Apps. Instead, you must create your document online or use an appropriate application in the Office 2010 suite to save the document directly to the Web. Mail merge options in Microsoft Word 2010 and Microsoft Publisher 2010 lack support for Microsoft Works database source files (*.wdb). Anyone who receives a PowerPoint's Broadcast Slide Show link can view that application online. The Broadcast Slide Show feature application does not require authentication. Students and teachers could easily co-author documents, spreadsheets, and presentations by using Office Web Apps in Microsoft Live. Teachers could copy/paste, then save homework assignments and instructional tutorials online for students to review. Posting instructional content on the Web even benefits students who were absent from class. PowerPoint's new audio, QuickTime video and photo editing capabilities, plus its ability to embed video files in a presentation, makes this tool more appealing to digital natives who appreciate being able to create original multimedia-rich content for online sharing. Should schools buy Office 2010? If your school or district has standardized on Microsoft Office, should you spend your limited technology budget dollars on the upgrade? Office 2007 users are already creating and saving documents in Open Office XML format, so you'll need a more compelling reason to upgrade. If you want to take advantage of the Office Web Apps, you'll either need to upgrade to upload them directly from an Office 2010 application. Otherwise, you must create them online or copy/paste the content into the online space. For Office 2003 users, an upgrade to Office 2010 seems much more necessary. Office 2003 is now two iterations old. It does not use the Open Office XML format. In our District, increasing numbers of users have started complaining about not being able to open and save documents in the newer Open Office XML format. Additionally, students, teachers and administrators have expressed interest in creating, editing and collaborating on documents online and across devices. Office 2010, unlike Office 2003, supports real time collaboration and 21st Century learning (http://www.p21.org/) through SkyDrive. Several people can co-author Word documents, Excel workbooks, or PowerPoint presentations and work on those documents simultaneously from different locations by saving their Office 2010 documents to the Web or to a hosted or on-premises SharePoint 2010 server. Check out features and tools in Office 2010 by downloading a free 30-day trial. Microsoft Office applications remain the standard against which all other word processing, spreadsheet, presentation and entry-level desktop publishing applications are judged. Office 2010 raises the competitive bar by adding many improvements and features supporting online collaboration and document sharing in real time. Its one-stop digital collection of productivity tools bundled under one common interface is hard to beat. $99 for Microsoft Office Professional Academic 2010 (consisting of Word, Excel, PowerPoint, Access, Publisher, Outlook, and OneNote), Journey Education's Academic SuperStore sells a downloadable Office Professional Plus 2010 for $79.98. Microsoft offers volume pricing to schools and districts as well.